Yeah, as I hoped it turned out that the first single was one of the very worst songs on the album (it's between that one and "End Game") and that there was one song with clear #1 potential (although so far blocked from actually becoming #1). I still would not rate this album among Taylor's best though (it could even be her worst). 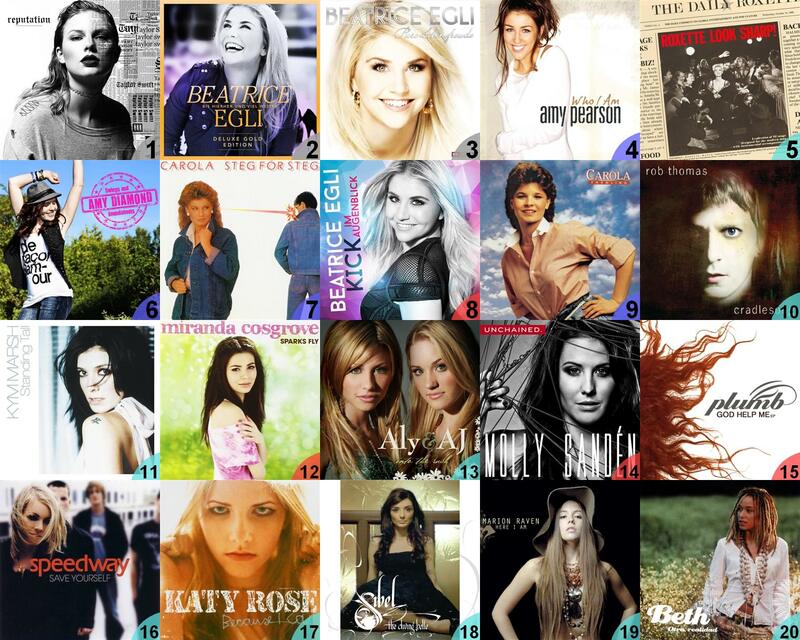 Also great to see Shania's new album on your charts. I guess you're familiar with her previous works, are you? I only know her singles and still need to get some of her other albums, however i really enjoy "Now" a lot. I actually never checked out her early stuff, but I'm very familiar with the previous two albums Come On Over (which was one of the first country albums I bought, in 1998) and Up! (which includes my 2002 YEC #1). Compared to those the new album is a complete non-event for me, although I already had low expectations after she had been gone for so long. LOVE Marina's success! A #2 debut for "Explicit" looks awesome and is the same entry position like on my charts. It's also impressive because she 'only' has one song on the main chart, so i guess you played the whole albums quite often instead of just one or two tracks. What caused the re-entry for "Shuffle The Cards"? Actually I haven't listened to the full album since the first week I heard it; the continued success is more due to "Miracle" and "Merci quand même". The return for Shuffle the Cards was a surprise to me too; it was just due to a lot of listening to songs from recent years where most (possibly all; haven't checked) songs on the album happened to get plays that week. Nice entry for Taylor and Lenka. Cute song and cute album, though both artists already released (much) better stuff IMO. Yeah, "My Sweet Mystery" has worked really well for several weeks, possibly because it sounds different from all other songs on the chart at the moment. Lenka's album made a weaker impression than her last one from 2015 (which made it to #7 and also had two songs reaching the top 30) but was still a nice listen from what I remember. 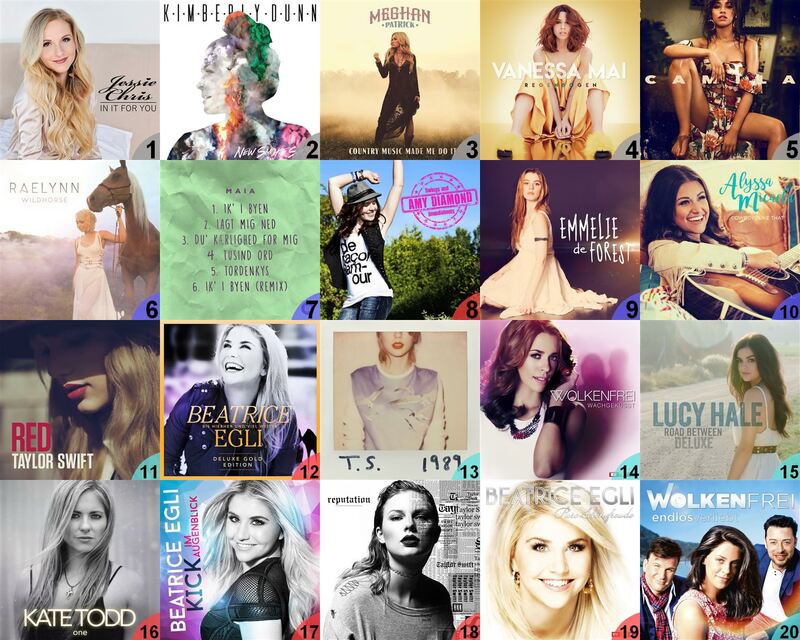 I didn't expect Taylor to have such a great start on your charts, but congrats to her. While i like the album, it's clearly not as good as i was hoping for. Even after several spins i'm still not that much into it, which never happened with a Taylor album so far. Amazing return for Hilary Duff's Album! This is the first album Taylor releases while I've been posting my chart here, but she's been having similar or greater initial sucess with the three previous albums (12 songs from Speak Now, all 19 from Red and all 16 from 1989. On the other hand, only a handful of her songs ("Fearless", "Haunted" and a few from Red) have stayed 20 weeks or more and most have left well before reaching 10 weeks. Probably that will happen now as well; I really only see "Getaway Car" still having a chance to chart in 2018. Definitely! I actually checked to see if it had already been released when "My Sweet Mystery" first charted. Later on I was busy and forgot to listen when the release actually happened, but now I've listened to it and it was quite good overall and with one or two other songs that has a decent chance of entering next week! Dress should be higher (so to speak!). Marina's album is not as good as Fearless for me. Unfortunately I'll have to disagree with you there. "Dress" is in the lower half of the songs on the album for me and I found Marina's new album stronger, although possibly only because of two songs ("Miracle" and "Merci quand même"). Wow! - I had no clue you are that crazy about Taylor! - We seem to have the same favourites. "Delicate" is awesome. 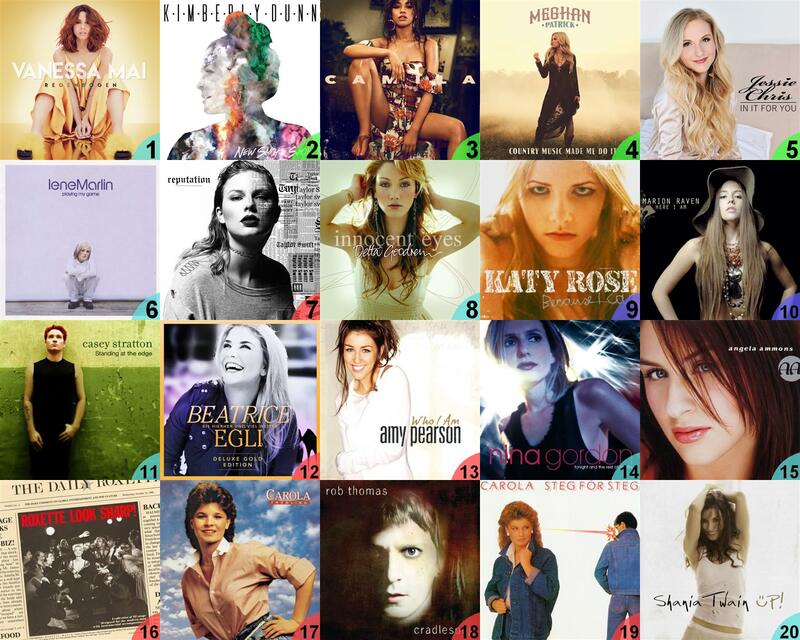 I hope it will get the single treatement at some point this era! Great that you agree on the top songs on the album! Although in general I don't care that much about single releases (after the album has already been released) I would really like "Getaway Car" to become a single, preferably in late spring or the summer (2019 is ok ). "Delicate" and "I Did Something Bad" also sound like clear singles to me. B) Stephanie Quayle's "Selfish" is a single and it's G-R-E-A-T! Have a feeling this song may go Top 40 or even Top 30 in my chart. 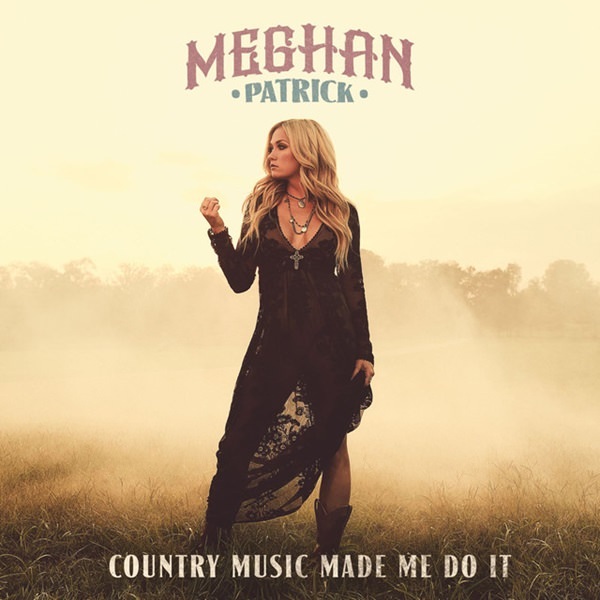 (It's moving very fast on the secondary US Country airplay chart) I'm glad for her it's doing so well (so to speak) since "Winnebago" was sort of meh! for me. Ha ha, sorry for "stealing" Meghan Patrick; I had never heard of her before you mentioned her last spring. Once an artist has already had success on my chart I usually find new releases by them on the day they're released to Spotify. A really great new single from her! I really didn't expect to like another of her songs (almost?) as much as "Breaking Records"! Just listened again to "Selfish", as I didn't clearly remember it from when I listened to the album. It's really nice! Will definitely get more plays. Yeah, "Winnebago" was meh for me too. 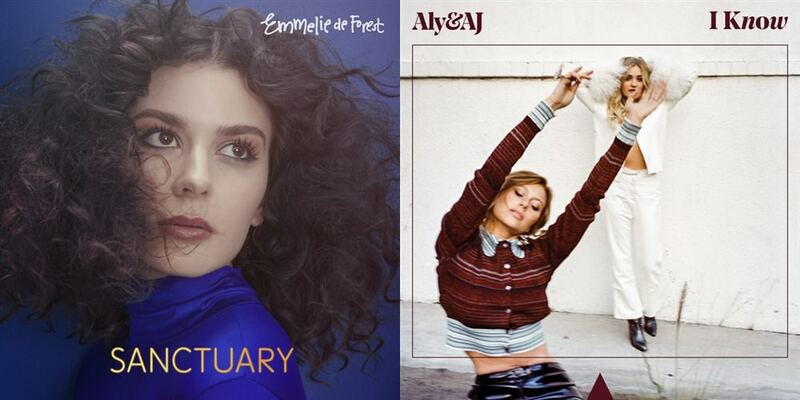 Emmelie de Forest is back with a new single and Aly & AJ returns with one of the songs from their now released EP. I agree about Lenka's album, i think "Attune" may be cute but that's it. She could do a lot better as she already did in the past. As for "My Sweet Mystery", it's nice that you're enjoying that different sound! Checked out your number one and i really enjoyed it! Is it a new single of an upcoming album? Love the stability for "My Sweet Mystery" & "Miracle" and that big climb for "Merci quand même" this week. "Don't Blame Me" has turned out to be my favorite album track of "Reputation" over the week so i'm also happy to see this one getting another week on your charts, even if it's still far away from being a hit. As for Aly & AJ, their new EP is really nice, and it's also the reason why i got back into "Take Me" again. That one remains my favorite, but i enjoy all songs from the EP. As for the album charts, it's probably absolutely no surprise that i absolutely LOVE that entry for "The Dark Element"! Definitely one of the best albums of the year for me, as it's what i wanted from Anette. The lyrics are often really cheesy but the melodies are so catchy and i just love her voice. It's also very nice to see a few songs on the bubblers list, even if "Heaven of Your Heart" and "Only One Who Knows Me" are my least favorite songs at the moment (but i still really like them). Also great arrivals for Rachel and Aly & AJ. "Waves" is one of the best pop releases of the year for me, but that #11 debut doesn't look too good. I guess nothing really impressed you there? My mistake, I didn't mean the lyrics as a whole, only that "Getaway Car" stole the exact line "X marks the spot where we fell apart" from Hilary's song . And it may sometimes take only a single word to remind me of an old favourite song and give that one a boost. I'm glad the album is growing on you! For me though it's been going downhill pretty fast (even though it is still #1). She screwed up by switching from country-pop to just plain pop imo. Still hoping she might switch back in the future. Yeah, that's how it works with my score system; even with the current rules it's often easy for one or a few songs to make the album successful. This would not be the case if there was a constant stream of new albums where I loved every track but those albums tend to come along very rarely these days. 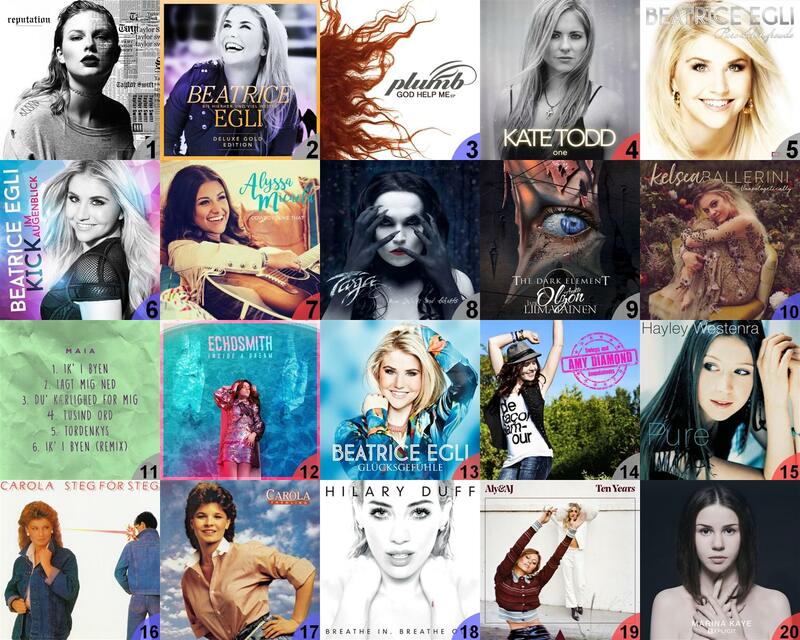 She's now actually tied with Avril Lavigne for most number of songs on my chart (67)! So while she's #1 for the first time she kind of screwed up by not having one more song on the album good enough to reach the top 30. It's not completely impossible that "New Years Day" will still make it, but the song is further from the top 30 this week than the two weeks before (35-35-38) so right now it doesn't look likely. And of course I'm hoping that Avril will release a new album soon so that she can leave Taylor in the dust! Yes! According to at least one article I found it is the title track from a new album set for release on January 12th. So that may become the first new album I listen to in 2018. Really happy you like the song! Unfortunately, I didn't like the EP nearly as much as I had hoped and "Take Me" remains very clearly the best song for me too. It's still not bad though. I agree that her voice is really good and while some of the tracks didn't appeal that much to me some are really good. For various reasons I didn't listen much to it for the second part of last week though. I still haven't found a real standout track on Rachel's new album but I did listen again to the whole thing (I think?) last week and I agree that there's something there that will probably make me listen again. 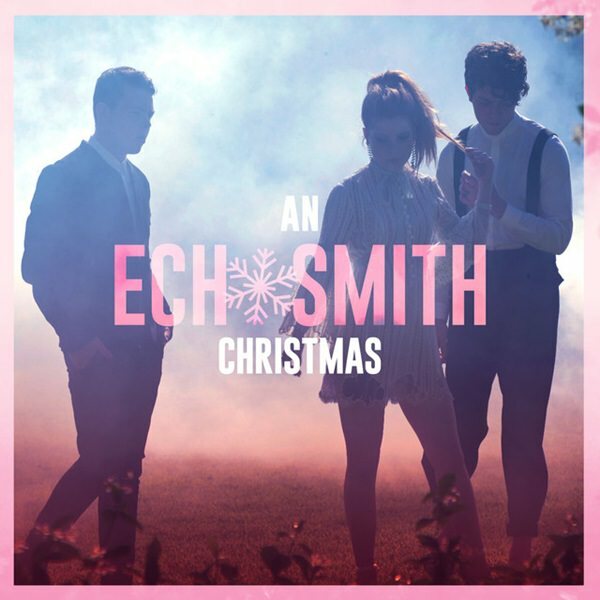 Echosmith gets their first #1 with the first ever original Christmas-themed #1! Classy but needs a better chorus. I prefer Echosmith's I Heard The Bells On Christmas Day. Yeah, while I really like the entire song I agree something is missing in the chorus for it to be up there with her very best songs. "I Heard the Bells on Christmas Day" is probably going to chart too in a few weeks! Like Echosmith last week, Catherine McGrath follows up a strong-enough-to-be-#1 song with an actual #1 song! Annemarie Eilfeld is back with a new single and a third song from Aly & AJ's EP reaches the top 30. …and now an interesting question: While these are both the artists with most entries on your charts, would you also consider them two of your most favorite artists overall, apart from the charts? While it’s good to hear your opinion about her voice, it’s obviously not that good to hear the second part about you listening to them less. But hey, they charted and already did better than I ever expected, so I’m already very happy you enjoy(ed) them! So... let me say something about the week i've missed at first. 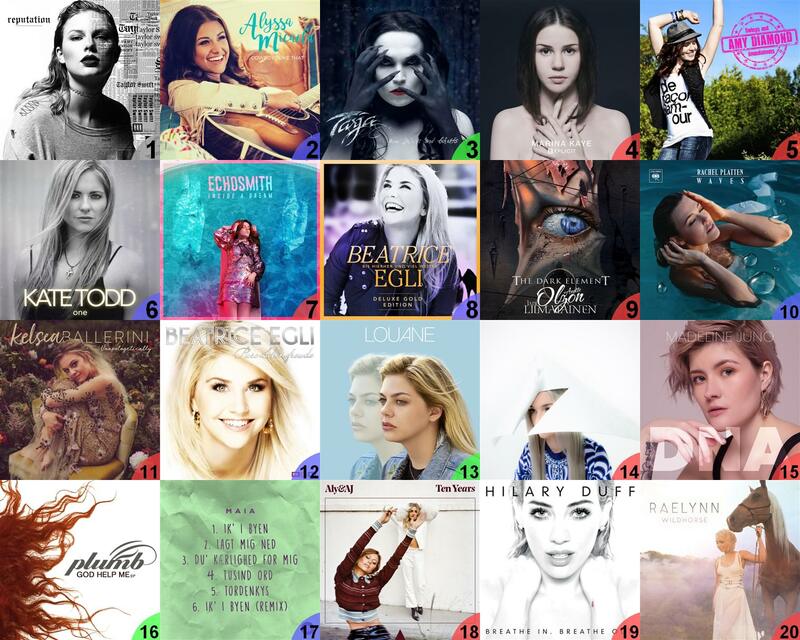 Other than that, nice jumps for "Sanctuary" & "Delicate", fantastic & brilliant debut for Tarja's "From Spirits And Ghosts" on the album charts ( ) and also nice debut for Louane's album, though i'm not the biggest fan, and same seems to be for you since it even missed the Top10. Over on the current chart, i also checked out that #1 and it's yet another nice song! Both this and Echosmith are nothing i would download straight away but still enjoy a lot while listening to them now. Also happy to see Aly & Aj getting an entry from their EP - so this means the EP (or at least "Promises") grew on you? 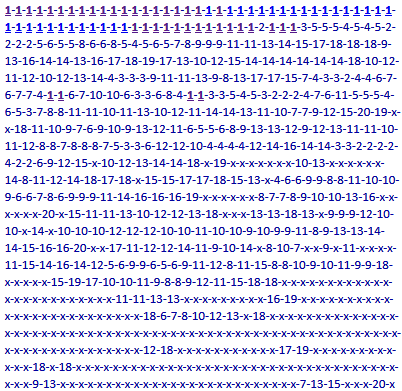 Thanks for commenting, Tansike and heppolo! Yes, they are definitely two of my most favourite artists, although they are not the two favourite ones. Actually, it's difficult to say who is at the very top right now. Taylor and Avril have released many albums with very few bad songs and also had some better-than-average luck in terms of releasing them when competition on my chart wasn't extraordinarily high. 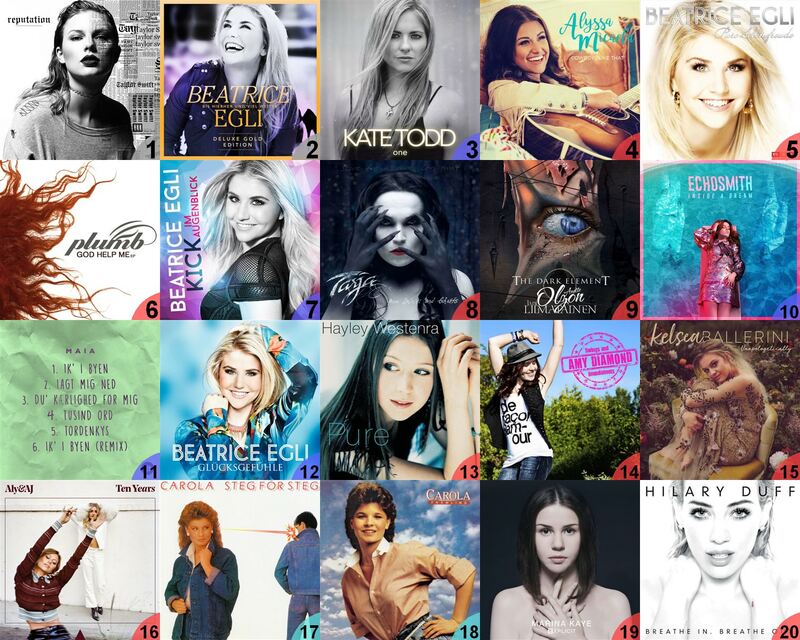 In terms of total plays they are both beat by Emmelie de Forest despite her having released only one album. 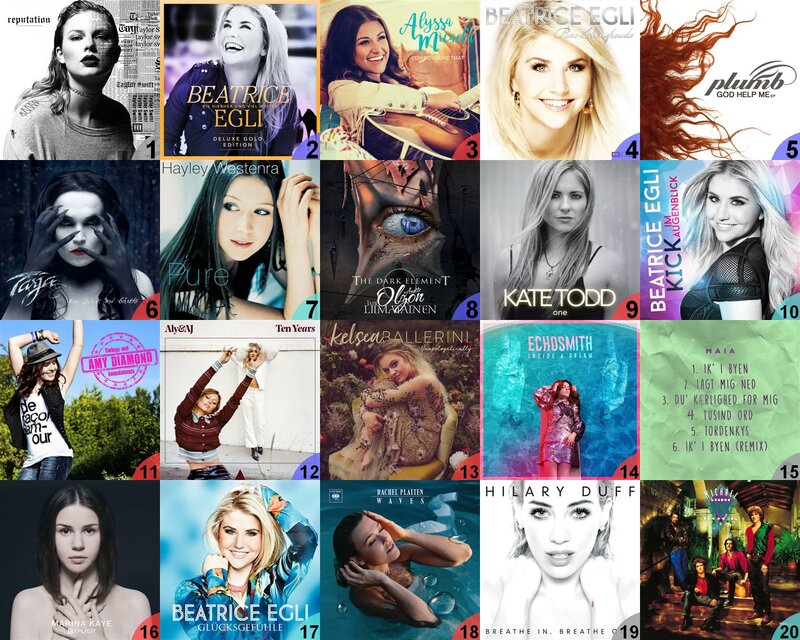 I would say that the total number of plays pretty accurately reflects which my favourite artists have been over time since 2000 (and then Amy Diamond is far ahead of Hayley Westenra who in turn is far ahead of Emmelie de Forest; 161k vs 29k vs 13.6k plays at the end of last year) but of course that's different from right now (they haven't even charted with any new songs since 2011-2013). Because that is "her" month (of course!). Songs and albums (when great enough) have very strong ties for me to the season of the year where I first listened a lot to them. If Only Teardrops isn't back in the top 10 of my albums chart in May 2018 (barring some very unusual spike in competition or catastrophic event) something must have gone very wrong with the universe. "Perfect for You" is one of the songs that stood out a bit, haven't really noticed the others though. Will probably listen again before the year is over. Thanks for checking it out! I didn't care much about Echosmith either before I heard "Get Into My Car" less than 3 months ago, although they charted briefly with "Cool Kids" in 2014. Their new stuff is much better imo. Actually there was a song on Louane's album that I really liked on the first listen but then completely forgot to listen to. So it's possible it may rise (actually re-enter) again soon. Thanks for checking out the new #1! It sounded like a very clear #1 for me from the first time I heard it (a few days after the release). As for Aly & AJ, ha ha, now all four songs on the EP have reached my top 30 but I still think it's not as good as I had hoped and actually I don't know why I even listened that much to those songs... It's not like every listen is a conscious decision so sometimes some songs get more plays than they should and vice versa, especially short term. Watch them crash and burn next week (hopefully) . I almost didn't notice but you may be right; usually there aren't so many albums that are on both our charts (partly because I often have many older albums occuping precious space...). Unfortunately I am a bit over it at the moment, but I still think it's a very good song! 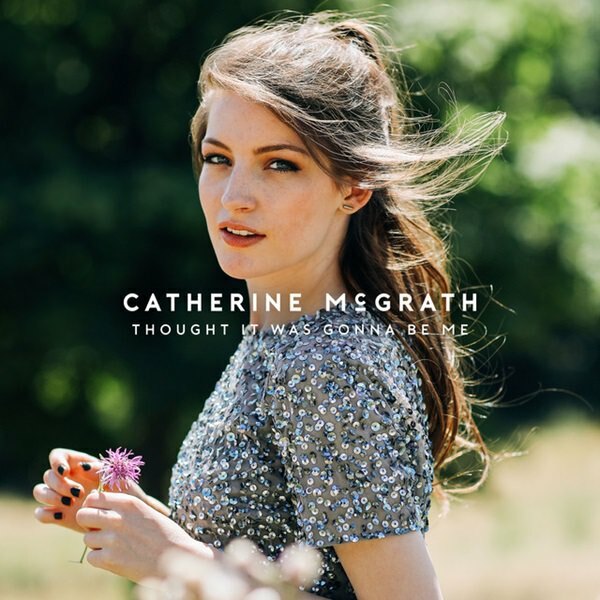 Catherine McGrath gets a second week at #1 with her perfectly non-Christmassy country-pop ballad. 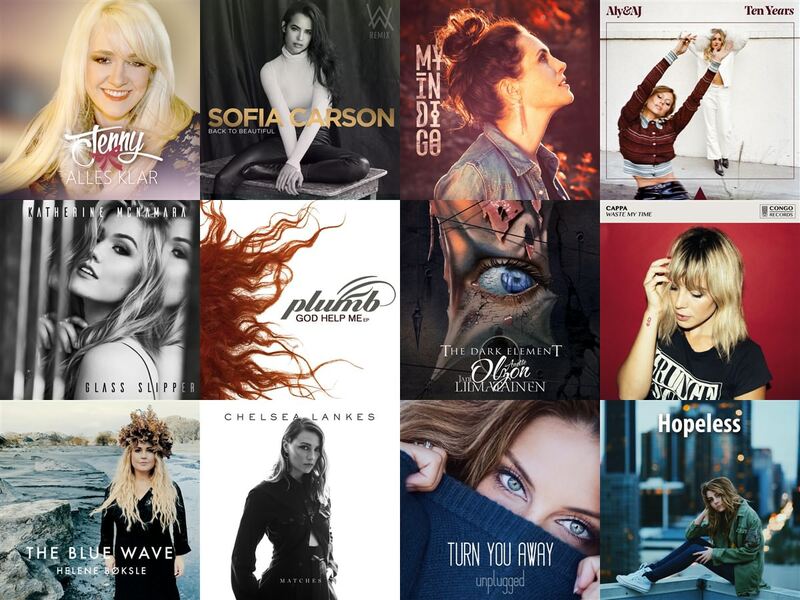 Single, EP and albums covers for twelve new entries and one re-entry, led by an unknown ";random"; German schlager song released in March. Catherine McGrath gets a third week at #1 with her country-pop ballad ";Thought It Was Gonna Be Me";. Single, EP and albums covers for this week's four new entries. Posting a day early this week, but next week's update might be delayed until Wednesday. Jamie-Lee climbs to #1 with her Christmas song (which is actually a cover of a song released in 2005). 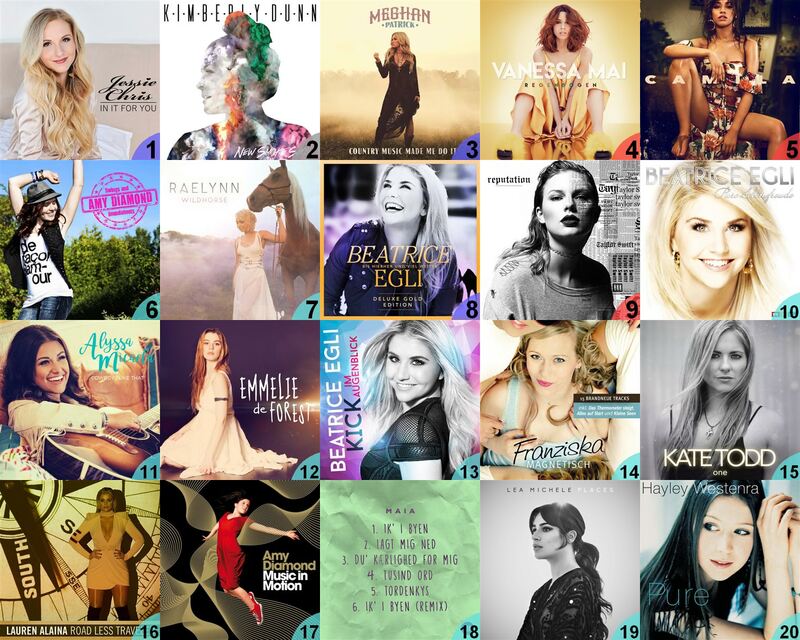 Single, album and EP covers for the new and re-entries this week. Jamie-Lee stays #1 with her Christmas cover. 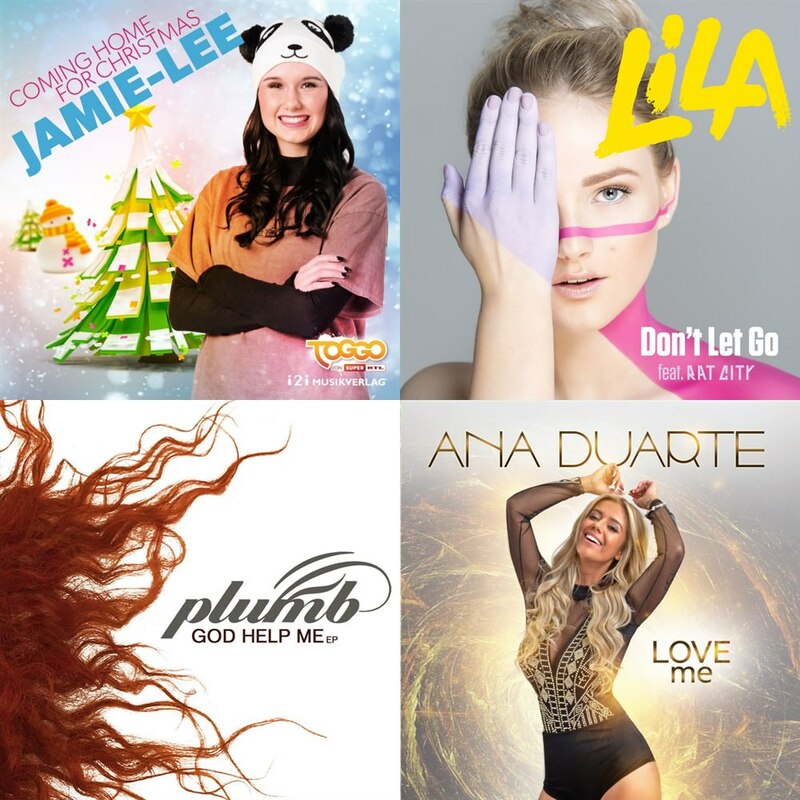 The five new entries of the last week of 2017, including a song from 2016 that will automatically be gone again next week. Other than avoiding songs from 2017, my thought process for what to listen to this week wasn't exactly refined but I don't hate the result as a lot of older albums that I like a lot get their chance to shine again. I'm a bit late... but: Best Wishes for 2018! Also a bit late, but I see you're still in the mood for christmas. I wish you all the best for 2018. I Hope your christmas was nice. Already listening to the new songs on your chart. Started with the christmas song. Didn't hear that one before. Thanks for commenting, trebor, Speedy and heppolo! Thank you! Best Wishes to you too. Yeah, I really liked listening to Carola when I was sick, and a lot of my other older favourites. I'm glad you noticed them! Actually not really in the mood for Christmas since 28th (or so) December, it's just my chart rules that led to the chart being (mostly) unchanged when I didn't listen to any songs eligible for the chart! Christmas was nice up until I got sick, after that I'd rather forget it. Thanks for checking out the new songs. I hope you found some you really like! Yeah, it's a really solid album. Those are my favourites on the album too, along with "Can't Turn Back", and actually every song on the album has at least 40 plays which is really rare these days! Vanessa Mai gets her first (solo) #1 with the song ";1000 Lieder"; from the new edition of her latest album. 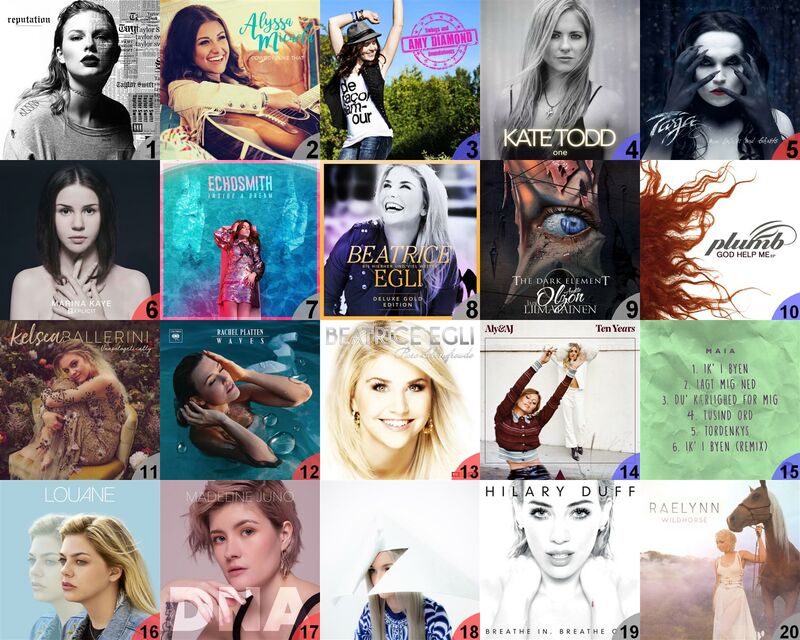 Five covers representing 17 new entries, a record high number of new entries for the first half of January. All songs released in 2017 still got zero plays this week, as I have still not listened to my 2017 YEC. But the chart is invaded by new songs released in 2018! Never before (in 18 years of charts) have there been so many new entries the first half of January and it's also a tied record (with week 4 2003) for any time in January. How many of these new songs will be able to stand the competition from the top 2017 songs once things get back to normal (next week more than likely)? Or is it the older songs that have seen their chance to shine again evaporize this year? Could Maia even fail to reach the 53 weeks that looked like the safest bet ever half a year ago? The entire top 6 is completely replaced since last week! Vanessa Mai's album, which originally peaked at #2, now returns at #1 thanks to the new edition with its four new songs. She is joined in the top 5 by four new albums released in 2018. 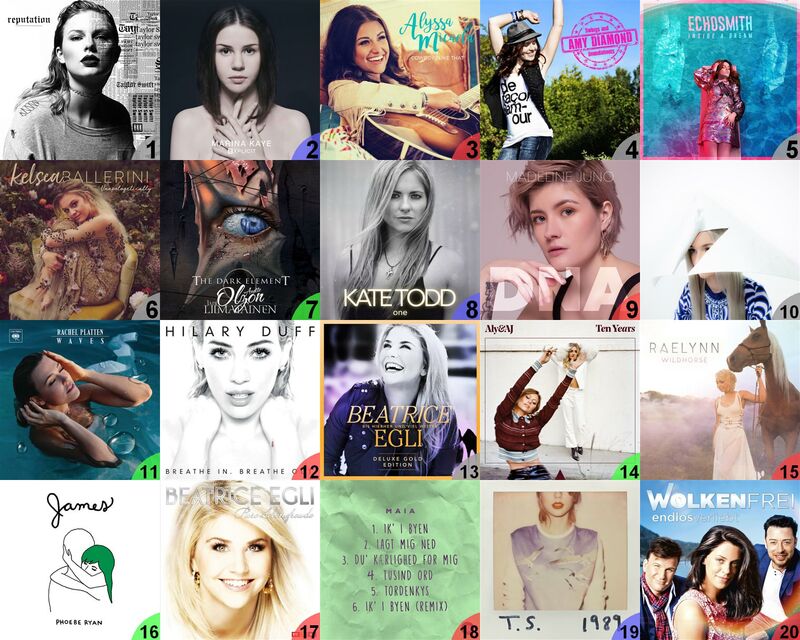 Poor Taylor Swift drops from #1 to #7 but nine weeks at #1 is not bad. Last week's #2 drops to #12 and the #3 (another Beatrice album) even falls below #20 as the rest of the chart is again invaded by some of my favourite albums from the '00s, including Nina Gordon's album that once held the record for most number of weeks at #1 (not beaten until 2004). 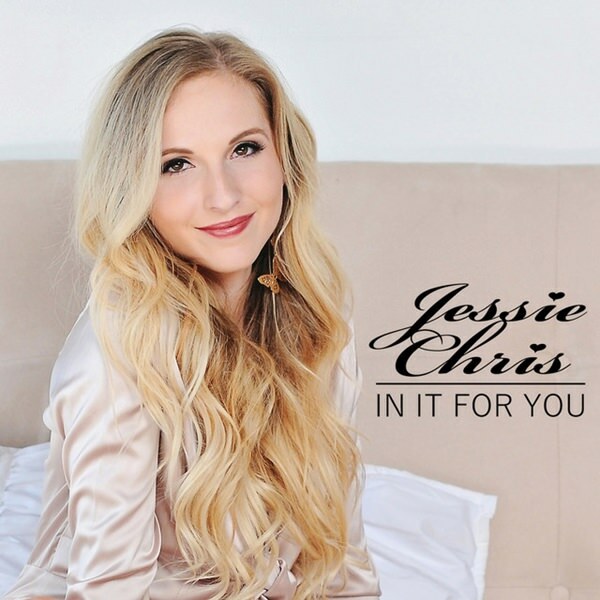 Young country singer Jessie Chris climbs to #1 with ";Heart to Break Your Heart"; from her album In It for You. 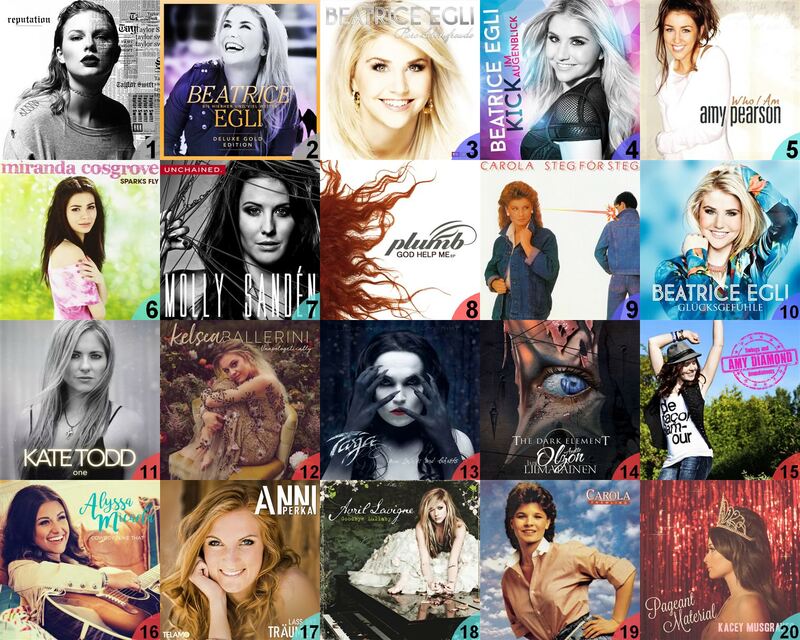 Covers representing the five strong re-entries, all of them from the YEC Top 20. Three of the four new albums from last week result in four additional songs in the top 30. Things were ";back to normal"; this week, with the top 2017 songs getting a lot of plays again and volume reaching more than 1,000 plays for the first time in a month. But it is one of the new songs from last week that claims the top position. Jessie Chris stays #1 with her country-pop ballad, chased by the 2017 YEC #1.